Ask us how you can use Facebook to drive sales for your business or any marketing related question you have by clicking here. Great companies are market leaders. Amazon, Apple, Coca-Cola, and Snapchat are examples that all lead their industry. What makes them great is a combination of people, strategy, execution, and purpose. Small and Medium-sized Enterprises (SMEs) must identify 3 priorities in each area of people, strategy, execution, and purpose. In the people category, these companies leverage individuals who see their jobs as an integrated role, strategy allows companies to go places they've never been before, and purpose enables organizations to be connected to something bigger than their products and services. Yet one theme we find with each of these great market leaders is that almost all have a strategic partnership with marketing agencies. For companies looking to take market leadership, work to refine what your company is great at along with developing a unique corporate mission that goes beyond great products and services. In this article, we look at which qualities make a market leader. With one insightful example after another from companies that are market leaders, we identify strategies for how your organization can become the market leader, the benefits of being a market leader, and how you can get the help to get there. In this podcast, we're going to discuss some of our favorite email marketing ideas that are sure to provide you with a lot of leads and conversions. Email marketing is considered one of the most effective methods of digital marketing but it needs to be done correctly and creatively in order to see optimal results. You could be missing out on up to 62% of your market if you are not ranking well in search engines like Google. How do you rank higher though? To do this you need to know what google looks at to determine what pages ranks where. This is hard to know for sure as Google never shares this information exactly. We have a pretty good estimate though. What we believe are the top 10 factors Google uses to determine where pages rank in search engine results are as follows: content quality, number of total backlinks, RankBrian, click through rate, relevant terms in the content of the page, # of social media shares, domain search visibility, number of referring domains, content freshness and length of URL. The learn how we came to this conclusion and what data we used continue reading this article. Business owners may be surprised to find that SEO usually generates 275% in ROI or an additional $2.75 in profit for every $1.00 spent. Profitworks provides customers with a sustainable strategy to increase their website traffic and sales. This article is paired with a companion podcast in which we discuss the difference of SEO (Search Engine Optimization / Organic) and PPC (Pay Per Click / Paid) advertising. First things first, we explain what organic search and paid search are in simple easy to understand terms and how each are utilized by businesses to marketing their products and services. The podcast concludes with determine whether search or paid search delivers a better return on your marketing spend dollar. After listening to the podcast and reading this article you determine that your business needs help understanding online marketing feel free to send us and email to discuss if our services would be a good fit for your business. Everyone who runs a website wants to know how Google determines which pages rise to the top of their search engine. In this podcast, we're going to discuss how Google's ranking factors work, how we determine what their ranking factors are, and share with you some of the ranking factors that we've discovered over our years as an SEO company. In this blog article and podcast, we're going to give you our 5 "60 second or less" tips that will help you to find the best marketing company for you. We understand that choosing the right marketing company to work with can be stressful so these tips should help to make the process a little easier. Profitworks Inc. is an expert in the field of Search Engine Optimization and Email Marketing, which is one of the highest average ROI marketing mediums available to businesses. If you're looking to make a marketing plan for the first time check out our FREE marketing template. Click here to check it out now! In this podcast we talk about the reasons why page linking is important to increasing Google search result ranking, what are some trends in how page linking is influencing search results, and tips on how to effectively use linking as a lever to propel your page into top ranking gear. Though linking is but one of the many factors in Google page rankings, we help clients use the right approaches in growing their business through page ranking optimizations, see here to contact us or to get a free review for your site. Profitworks Small Business Services provides website search engine optimization and website conversion optimization services which win more customers for our customers. This podcast will provide stats on the significance of longtail keywords versus head keywords along with lessons learned from online case studies that were conducted so you can quickly make use of this powerful insight for your business. If you would like an audit of your search engine optimization or social media activities, contact us to book an appointment to discuss. Here at Profitworks we offer SEO services, Email Marketing Services and Social Media services to help grow your business and increase your revenue. If you are not familiar with any of the terms referenced in this article, scroll down to the bottom of the article where you can find detailed descriptions explaining each term. In this blog article and podcast, we're going to show you our list of the 25 best marketing ideas that can help to give your marketing plan a major boost . Some of the top 25 include creating relevant content for your website, marketing through contests, investing in email marketing and others. These marketing ideas are a great option for anyone looking to build a marketing plan for a first time, or for anyone looking to improve their current marketing plan. Profitworks Inc. is an expert in the field of Search Engine Optimization and Email Marketing, which is one of the highest average ROI marketing mediums available to businesses. If you're looking to make a marketing plan for the first time check out our FREE marketing template. Click here to check it out now! In this podcast, we are going to talk about some of the best marketing blogs that you can find on the internet. There is a ton of information out there on marketing so we thought it would be nice to have some of the top blogs available in one place. The 50 articles we mention here should help to give you a solid marketing foundation whether you're only just beginning to learn about marketing or you're a seasoned veteran. Profitworks Inc. is an expert in the field of Email Marketing which is one of the highest average ROI marketing mediums available to businesses. We also engage in SEO marketing. Contact them now to learn more! In this podcast, we are going to talk about why email marketing services have such a good return on investment. We'll discuss the philosophy behind why email marketing continues to generate a good return on investment and give you some tips on how you can optimize your email marketing to generate even more revenue. Profitworks Inc. is an expert in the field of Email Marketing which is one of the highest average ROI marketing mediums available to businesses. Contact them now to learn more! In this podcast, we are going to talk about some of the good, bad and ugly articles that are based on direct email marketing. When you're looking for tips to help you come up with effective marketing emails there is a ton of information available. Some of this information is excellent, but others may provide you with poor information that could actually hurt your conversion rates. The 6 articles we mention in this article should help to give you a solid foundation of what makes an effective marketing email, and should help to give you some ideas of what to avoid. Profitworks Inc. is an expert in the field of Email Marketing which is one of the highest average ROI marketing mediums available to businesses. Contact them now to learn more! In this podcast we are going to talk about some of the best email marketing case studies out there. Email marketing has shown time and time again to be one of the most dependable marketing methods for small to medium sized businesses. It's been proven as a constant provider of a high return on investment despite competition from other outlets such as social media marketing. These five case studies will help to show that email marketing is alive and well, and should be included in the marketing plan of every business. Profitworks Inc. is an expert in the field of email marketing which has one of the highest ROI's of any marketing type. Contact them now to learn more! In this blog article and podcast, we are going to talk about some of the best marketing articles that focus on the topic of ROI or return on investment. Return on investment is a popular metric that is used to measure the efficiency of different investments. It's also a great way to compare different marketing tactics and marketing mediums to determine which is delivering better results for your companies bottom line. The 5 articles we mention in this article should help to give you a solid foundation and understanding of ROI and how it relates to marketing. Profitworks Inc. is an expert in the field of Search Engine Optimization and Email Marketing which are two of the highest average ROI marketing mediums available to businesses. Contact them now to learn more! This podcast and video is a seminar we held recently titled "Thing You Can Do Today To Get More Sales From Your Website". The goal of the seminar was to provide business owners and marketing managers items they can implment on their website on their own with minimal time to increase the sales they get from their websites. In the seminar we did review a few websites of the attendees' but we have removed this section to not leak any confidential competitive information of the attendees. If you would like a digital copy of the presentation slides or you would like a free review of your website to see what could be done to increase the sales from your website just contact us. 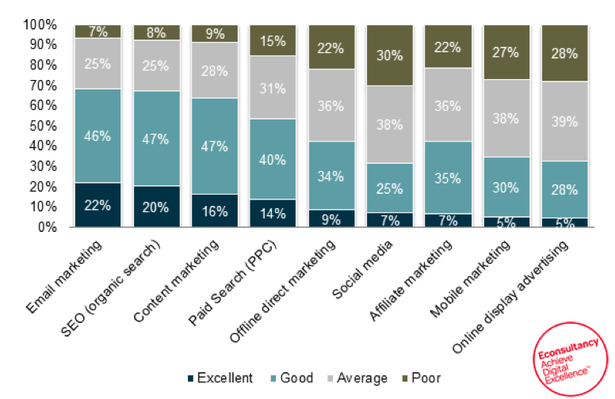 The top marketing channels for the best percentage of high quality leads are trade shows, events, email marketing and referral/advocate marketing. When you look at which methods also have the best return on investment the best methods are referral/advocate marketing, email marketing, events and search engine optimization. Marketing can be done through a wide range of channels/methods and various tactics for each channel that will all yield different results based off of many different factors. This article will provide insights into which marketing channels/methods that are on average the best. The information in this article is based on Profitworks' experience providing marketing services to our clients, as well as various third-party studies that have been done on the effectiveness of marketing channels. In this podcast we have the pleasure of interviewing Professor David Rose, from the University of Waterloo and the Conrad BETC who lecturers in the MBET program. In the interview, Professor Rose comments on what exactly an entrepreneur is, who can be an entrepreneur, what are the determining factors to whether a business will be successful or not, advice on the marketing of new business ventures and advice for where to start if someone is looking to begin a new business venture. At the very end of the podcast he gives some great advice for all business owners and managers looking to be successful. Be sure to listen all the way to the end to hear this great advice. In this blog article and podcast we are going to talk the return on investment from different marketing methods. We will discuss the industry ROI averages for different methods and give a conclusion on which method has the best ROI. In the blog article you can also find graphs that give a visual display of this information. In this blog article and podcast we are going to talk about how to measure the effectiveness of your search engine optimization. We will discuss what goal you should be tracking, how to evaluate your website compared to the competition and how to measure the sales performance or your website. If you would like to see how your website traffic compares to your top competitors you can click here and we will send you back a report free of charge. Click here if you are interested. In this blog article we are going to discuss the ROI that can be gained from website videos and use several hypothetical examples to explore the topic. The article will go through how to measure success, ROI calculation, what your video should have, why videos are important, examples and lastly a conclusion about different video types. In this podcast we have the pleasure of interviewing Jerome Katz, Professor Of Entrepreneurship at Saint Louis University. In the interview Professor Katz comments on what are the key things to be a successful entrepreneur, trends in small business today, information on what marketing methods have the best ROI for entrepreneurs and tips on hiring your first employees. The single most important factor to entrepreneur success as seen in his research and experience is not having a great idea. Instead the single most important factor is having customers in hand that have a problem, which you can solve for them. Listen to the podcast below to hear specifically what he means in more detail and all of the other advice and tips he provides. In this podcast we are going to talk about what Profitworks is working on to become the best SEO service provider, and some of the value-added services that we offer to our clients. In this blog article and podcast, we are going to talk about the social media marketing services versus SEO marketing services. The primary goal of this content is to explain the top reasons to spend a marketing budget on SEO instead of social media. Improving your website conversion rate means more people are taking actions that you would want them to take. This could mean an increase in email addresses provided, leads for sales or even direct sales from the website. Overall improving your website’s conversion rate can only mean good things for your business, but the few direct results seen above are just the end means of the process. There are plenty of reasons why a website’s conversion rate is important and that’s why it’s incredibly important to constantly optimize your website’s ability to convert. This podcast will run through some of the main reasons why conversion rate optimization is so important which will show you why you should consider it today! In this blog article and podcast we are going to talk about the ROI of search engine optimization (known as SEO) versus the ROI of pay per click advertising (known as PPC). The goal of this blog article and podcast is to clearly show which has the better return on investment, and explain the compounding power of search engine optimization in a simple, easy to understand explanation. In episode #15 we talk about the the importance of SEO, which stands for search engine optimization. In this episode will look at the benefits of doing SEO weekly on your website, the disadvantages of not conducting SEO, discuss what Google thinks about SEO and the consequences of ceasing to conduct SEO weekly on your site. In this podcast we compare the return on investment of organic traffic (which is generated by search engine optimization) and social media traffic (which is generated by social media activities or social media advertising). From our research one appears to have a great return on investment for businesses and the other has a terrible return on investment. This is extremely suprising given both seem to be all the hype in the last few years in the small business community, on blogs and from marketing speakers. A large portion of business are being misguided, wasting a lot of money, time and energy that is not benefiting their business. If you would like an audit of your search engine optimization and social media activities contact us to book an appointment to discuss. If you are not familiar with any of the terms referenced in this podcast, go to this article on our blog and scroll down to the bottom of the artilcle where you can find detailed descriptions explaining each term. In this podcast we discuss the top 3 tips we have for B2B Small Businesses the search engine optimization efforts. If you would like us to look after your SEO for contact us now to book a time to discuss. The top three tips we outline in detail are post new content reguarily, determine what keywords you want your website to rank for and ensure each page on your website has the proper meta data. In this podcast we discuss what SEO outsourcing is, the reasons to and benefits of doing it, as well as an example of the return on investment that can be achieved. If you are not even clear on what SEO is click here to learn what SEO or Search Engine Optimization is. If after listening to the podcast and reading this article you determine that your business needs help with search engine optimization for your webiste send us and email to discuss further to see if our services would be a good fit for your business. In this podcast we discuss the difference between organic versus paid search. In the podacst we start by explaining what organic search and paid search are in simple easy to understand terms and how each are utilized by businesses to marketing their products and services. The podcast concludes with which of organic search or paid search delivers a better return on your marketing spend dollar. In this podcast we discuss if search engine optimization is worth the money or not and how to properly calcuate the ROI return on investment for SEO or maketing methods of any kind. This podcast was inspired by an article on SEW titled "Is SEO Worth It In 2015?" In his podcast you won't find fancy words or things you don't understand. We break down everything into simple to understand business terms. Listen to this podcast to quickly learn the answer to your question of what is search engine optimization. (search engine optimization is also referred to as SEO). In this podcast we explain in very simple and layman terms what seo is, how it is done, our philosophy towards SEO, and what kind of return on investment you can expect from search engine optimization.